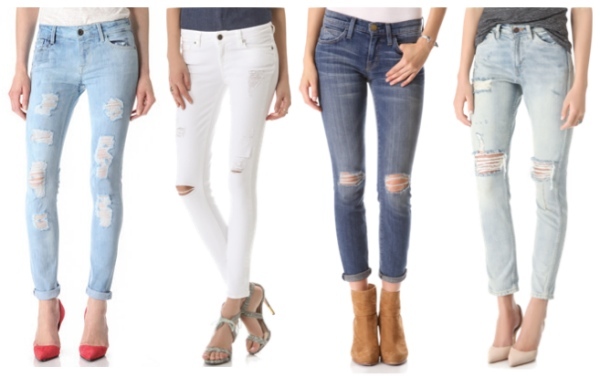 Ripped, shredded and slashed jeans are a huge trend right now! Most of us wear jeans throughout anytime of the year, however a trend that has exploded this season are jeans with slashes and rips down the front, making ripped holes instead of distressed areas. They are PERFECT for a casual day out in the city or a girlie night out. I have invested in almost EVERY colour recently from a number of high street stores like Topshop, River Island and New Look. Today, I am wearing these fab denim blue ripped jeans from Topshop, the white short sleeved shirt is from New Look and so are the boots and the hat.